The Warmate micro combat unmanned aerial vehicle is designed by WB Electronics. Image courtesy of WB Electronics S.A. The Warmate loitering munition is armed with electro-optical (EO) / fragmentation charge and EO / linear cumulative charge warheads. Image courtesy of WB Electronics S.A. The Warmate air vehicle next to Manta UAV seen during the MSPO 2015. Image courtesy of WB Electronics S.A.
Warmate micro combat unmanned air system (UCAS) is designed by WB Electronics to assist the armed forces and special forces in close combat situations. The air vehicle is integrated with interchangeable payloads and intended for both attack and reconnaissance missions. 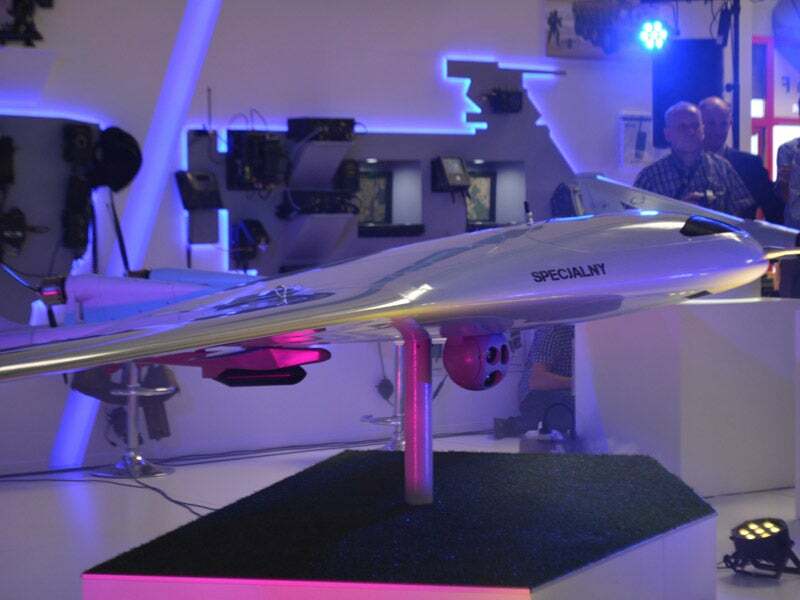 It was unveiled at the 23rd International Defence Industry Exhibition (MSPO) held in Kielce, Poland, in September 2015. The warheads aboard the drone were designed and manufactured by the Military Institute of Armament Technology of Poland (MIATP) in collaboration with WB Electronics. The UAS system comprises a dual-use, micro unmanned air vehicle (UAV), launch canister, payloads, explosive warheads, and ground control station. It can be operated from the military vehicle platforms such us infantry or armoured personnel carriers. A single operator is required to control the drone, which has a take-off weight of 4kg. The UAV is fitted with a pair of foldable main wings swept rearward, and a pair of vertical tail fins arranged in V-shape. It fits into transport cases or backpacks, based on its configuration. The drone is launched from a cassette pneumatic launch system in both combat and reconnaissance roles. Its wings are folded back when prepared for launch and are unfolded automatically when the UAV is airborne. The attack version is intended for single-use, whereas the reconnaissance variant can be recovered using the deep-stall landing method. The Warmate loitering munition variant can be flown semi-autonomously or manually by its operator from the ground control station, when deployed in combat operations. In reconnaissance configuration, the flight is autonomously controlled by an onboard autopilot, which directs the UAV towards its designated waypoints following a pre-programmed flight route. The UAV is integrated with an encrypted data link for exchanging flight control and sensor data with the ground station. The reconnaissance version is outfitted with GS9 electro-optical (EO) / infrared (IR) payload camera, stabilised in two axes, for observation, surveillance, identification, detection and recognition of objects in both day and night conditions. "The Warmate loitering munition can fly at a maximum velocity of 150km/h and can operate over a line of sight (LOS) range of 10km." In loitering munition role, the micro UAV is armed with EO / fragmentation charge warhead (GO-1) as well as EO / linear cumulative charge warhead (GK-1). The 300g TNT GO-1 high-explosive warhead is used to identify and attack the enemy personnel up to a range of 10m. The GK-1 is employed for the identification and destruction of the enemy’s light armoured vehicles and is capable of penetrating 100mm to 120mm of rolled homogeneous armour (RHA). The UAV can also be equipped with laser homing guidance head. A remote video terminal at the mobile ground control station allows the operator to downlink reconnaissance data and videos acquired by the payloads. A dual-axis automatic tracking antenna establishes reliable communication between the aerial vehicle and its associated ground control system. When operated from a vehicle, the UAV’s ground control station can be integrated with the onboard subsystems architecture of the launch platform. A two-blade propeller, mounted at the rear, generates thrust for the air vehicle, which has the ability to stay in air for up to 30 minutes. The Warmate loitering munition can fly at a maximum velocity of 150km/h and can operate over a line of sight (LOS) range of 10km. Its maximum flying altitudes are 500m above ground level (AGL) and 3,000m above mean sea level (AMSL). The operating altitudes of the UAV vary from 30m to 200m above the ground level (AGL).